Chelsea went into the season as defending Premier League champions for the first time since 2006/07 after ending Manchester United's run of three consecutive titles, and they carried on from where they left off with five wins on the spin, including back-to-back 6-0 triumphs over West Bromwich Albion and Wigan Athletic. Brazilian midfielder Ramires was the Blues' biggest addition in the summer of 2010. Manchester City made a host of marquee signings, including Barcelona midfielder Yaya Toure and Spain international David Silva and they began to reap the rewards as they moved up to second in October. The old guard of Manchester United, who were in search of an English record 19th top-flight title, shone in their 3-0 win over Newcastle United on the opening weekend as Ryan Giggs scored for the 19th consecutive PL campaign when he volleyed home a cross from Paul Scholes. A 3-2 win against Liverpool, who were managed by Roy Hodgson after he moved to Anfield from Fulham in the summer, soon followed. United striker Dimitar Berbatov was the star of the show and scored a hat-trick, including a spectacular overhead kick. The Bulgarian, who won the Golden Boot after his best season yet on English shores, also managed a five-goal haul in United's 7-1 victory over Blackburn Rovers in November. Liverpool briefly slipped into the relegation places with four losses in their opening eight matches, one of which came against Blackpool, who lit up the Premier League in the early stages of their debut season in the competition. The Tangerines, led by manager Ian Holloway, claimed a 4-0 win at Wigan Athletic on the opening day and were in eighth place at the turn of the year. A busy January transfer window followed, with Fernando Torres and David Luiz moving to Chelsea, while Andy Carroll joined Liverpool for a club-record fee after a great start to the season with newly promoted Newcastle United. Uruguayan striker Luis Suarez also joined him at Anfield and enjoyed an encouraging first few months in England. Unbeaten Manchester United topped the table going into the new year. That run lasted until they suffered a 2-1 defeat by Wolverhampton Wanderers in their 26th league match of the season. Arsenal were close behind the two Manchester clubs in third, despite being on the receiving end of a late 3-2 defeat by north London rivals Spurs in November. The Gunners moved up to second soon after but one of the matches of the season would signal the start of a run of dropped points that would ultimately put pay to their title ambitions. Arsenal took a 4-0 advantage over Newcastle but the Magpies hit back and Cheick Tiote sealed an extraordinary comeback with a volley from long range to earn a 4-4 draw. 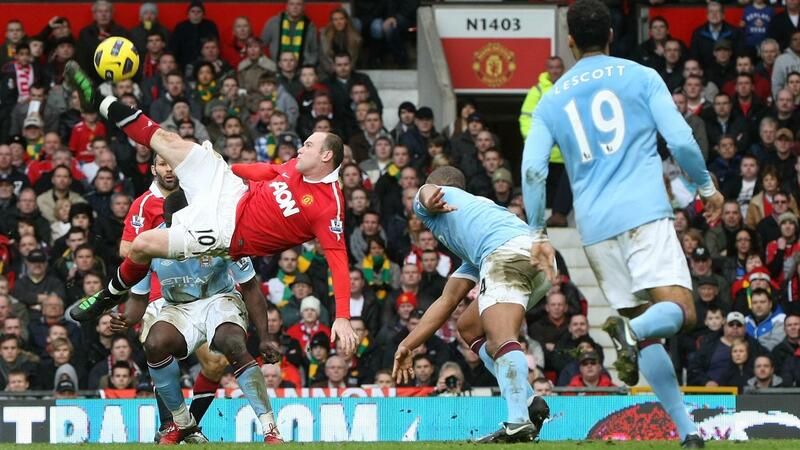 Just a week later, Wayne Rooney scored the goal that was voted the best ever in the Premier League's 20 Seasons Awards. The Manchester United forward's stunning overhead kick sealed a 2-1 win over rivals Man City, which put the Red Devils four points clear at the top. United stayed at the summit for the rest of the campaign and moved six points clear of Chelsea with two matches left after beating the Blues at Old Trafford. Mexican striker Javier Hernandez, who netted 20 goals in all competitions in his debut season at the club, put them in front inside the first minute and Player of the Season Nemanja Vidic wrapped up the win. 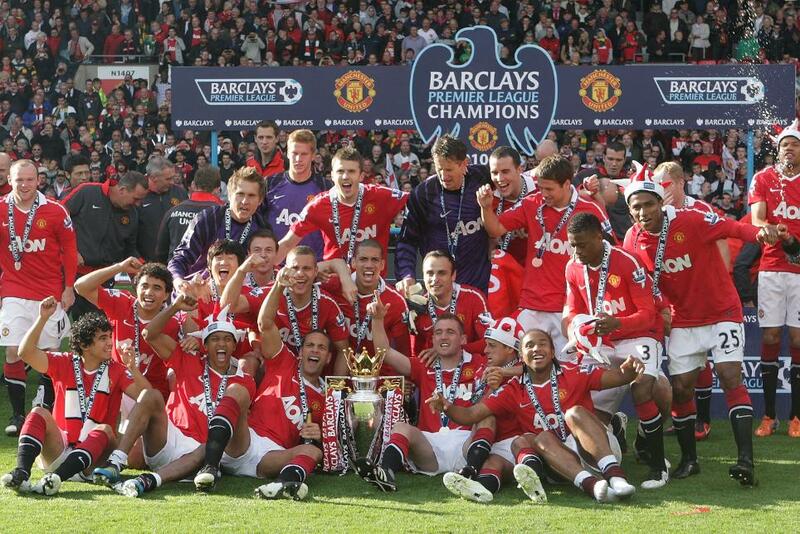 Captain Vidic lifted the Premier League trophy as they finished nine points ahead of their nearest rivals. Man Utd could not overcome Barcelona in the UEFA Champions League final at Wembley Stadium in May but it was still an historic season for the Red Devils as they moved clear of Liverpool's 18 top-flight titles. With Man City and Arsenal's top-four places confirmed along with Chelsea, attention switched to a dramatic relegation battle on the final day. Wigan Athletic kept their hopes alive in the penultimate weekend with a last-gasp 3-2 win over West Ham United, which confirmed the Hammers' relegation, and the Latics stayed up after beating Stoke City 1-0 at the Britannia Stadium on the final day. Also on the final day, Blackpool's immediate return to the Championship was confirmed after a 4-2 defeat by the champions at Old Trafford. The remaining relegation spot was between Wolves and that season's League Cup winners, Birmingham City, and it went right down to the wire. Wolves went 3-0 down at home to Blackburn Rovers, while Spurs forward Roman Pavlyuchenko and Birmingham's Craig Gardner both scored with long-range efforts to make the score 1-1 at White Hart Lane. A well-worked Jamie O'Hara goal gave Wolves hope at 3-1 and Steven Hunt's curling effort made it 3-2, dragging Wolves out of the drop zone on goal difference. With Birmingham pouring forward, Pavlyuchenko's powerful second for Spurs confirmed the Blues' relegation.